This chapter provides the enthalpy of formation of N-U (nitrogen-uranium) system. Katsura et al. [98Kat] have investigated thoroughly the formation of α-U2N3+x starting from metallic U with a mixture of N2 and H2. The reaction takes place even at 570 K.
In a thermodynamic study Nakagawa et al. [98Nak] have determined N2 pressure-composition isotherms at temperatures between 670 K and 1170 K for the single phase α-U2N3+x. 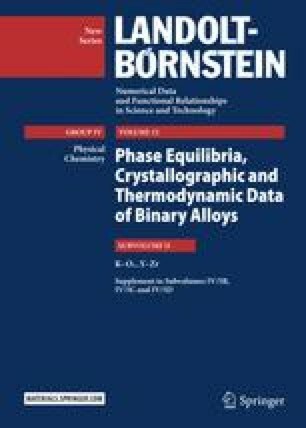 From results obtained the authors calculated the partial molar free energy, enthalpy and entropy as a function of N2 content. The enthalpy of formation of UN has been estimated by Suzuki et al. [98Suz] on the basis of mass spectrometric experiments to be about ΔHS = −296 kJ mol−1 (see also [75Ack]).